When it comes to international media and visitor attention, Pamplona gets all the love! Few places on earth offer the potential for fun, games and gastronomic pleasures like Pamplona does. However, Northern Spain has a lot more to offer, and only a short stone’s throw away from Pamplona. So, either before or after the unforgettable experience that is San Fermin, why not spread your love to these less acclaimed but equally wonderful locations? La Rioja Wine Region from a local perspective! Voted World’s Fifth Top Destination and branded Culinary Capital of Europe by renowned travel magazine Condé Nast Traveler in 2013, when you visit San Sebastian, according to the publication’s editors “all you need to do is eat, eat and eat!”. Yes, San Sebastian is quite the foodie’s paradise, with 16 Michelin Star restaurants spread throughout the city. But while we are all for enjoying the gastronomic pleasures of the Pearl of the Cantabrian Sea – as people here lovingly call their city – there’s a lot more to this northern treasure which, we’d love to share with you. Although San Sebastian has received a whole host of awards and decorations, it remains a humble and welcoming city forged on its origins as a charming and quiet fishing village. True, the city was given a superb belle époque makeover in the nineteenth century by Spanish royalty wanting to escape the scorching heat of the country’s capital. But, besides that elegant Art Nouveau legacy, San Sebastian is still home to some of the most hospitable and friendly people in Europe. And that’s what we want you to experience – the serene and the trendy; the new and the old; the historic and the vanguard! Don’t forget to bring your towels and swimming trunks, as you might want to hit the stunning beaches in San Sebastian! Bilbao or The Botxo (Hole), as we’d like to call it here, has come a long way. Back in the days when we were growing up, Bilbao was the industrial capital of the Northern coast of Spain. As a result of decades of industrialization, Bilbao’s natural beauty was neglected and heavy industry and industrial wastelands dominated everywhere. Today, that once unkempt and dishevelled town houses a quirky city that has reinvented itself as one of Europe’s major cultural centers. This surprising transformation is partly due to the presence of the international symbol that is the Guggenheim Museum. Thanks to this exciting attraction, Bilbao has managed to rid itself of the title of “quick stop-over on the way to San Sebastian” only to become a fascinating tourist destination and gateway to the unique Basque culture on its very own right. A true example of urban transformation, Bilbao features a number of hallmarks that make it truly unique – but, on top of that list, it’s the shimmering titanium landmark on its riverfront walkway that is the Museo Guggenheim Bilbao. But Bilbao’s real character and the hard-working, down-to-earth nature of the Basque people never truly disappeared. Quite, the opposite. And that’s what we’d love to share with you. Will you come with us to visit the real Bilbao behind this cultured and modern city? 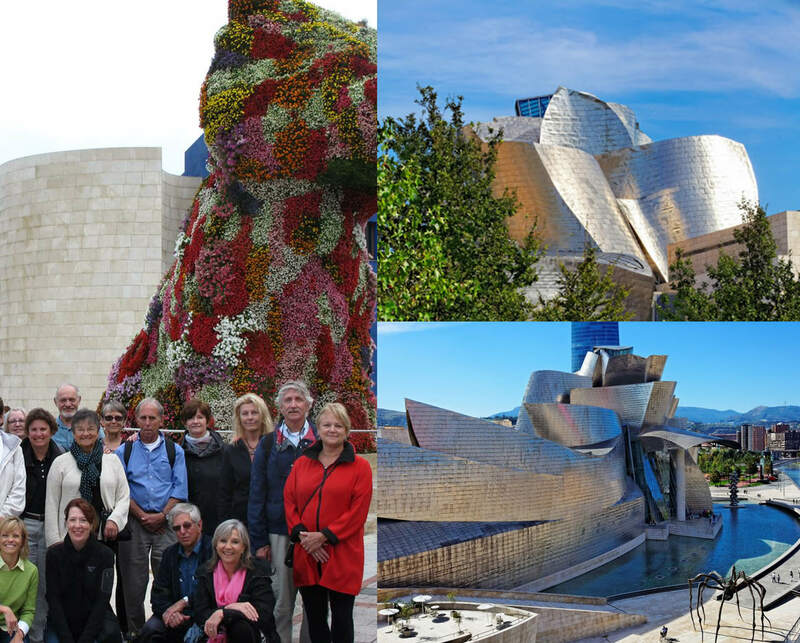 While Bilbao is famous for the Guggenheim Museum, there’s so much more to this wonderful place! Originally a working man’s city, full of industry and grit, it slowly transformed into a world class art center. The old town is rife with entertainment, tapas bars and beautiful churches. A walk down the river front reveals a plethora of unique and quirky architecture. Thanks Fran for showing us the best of this amazing city! Bilbao was another city we found especially beautiful, with many wonderful places to visit. In addition to the Guggenheim museum, Francisco took us to see other examples of modern architecture, artwork, parks, and shopping districts. What a great XXI century city! Guided Visit from 11:00 am to 13:00 pm. You’ll discover both the modern and the old Bilbao. Make sure you bring a comfortable pair of shoes with you as there’s plenty of walking to be done! Named the 2012 Gastronomic Capital of Spain, this mostly undiscovered region of Spain, South of Pamplona has a lot more to offer than an incredibly diverse and extremely satisfying food and drink culture. So, prepared to be surprised! But most of all, you’ll find some of the most charming and hospitable people in the entire Iberian Peninsula. So, why not include this unexplored jewel in your itinerary? If you do, make sure you plan appropriately and limit your food intake before traveling to La Rioja, because saying no to the many amazing eats and drinks you’ll find will be an absolute waste of a trip! Situated along the Camino de Santiago, La Rioja is not as ostentatious as other regions but its ochre-coloured earth, bright blue skies, its internationally renowned wine varieties and its hearty gastronomy will surely win you over in no time! Ready to be surprised and delighted? Visit La Rioja with Pamplona Fiesta.